16 Apr Flea and Tick Preventatives. 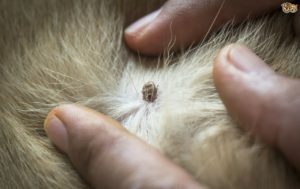 Now that we can almost believe Spring is here, it’s important to talk about tick and flea preventatives. There is a lot of confusion about which is the best flea and tick medicine to give a pet. A collar that emits the active ingredients slowly? A liquid-like spot-on that you apply monthly between the shoulder blades? Or a pill? And among those three choices, what are the best brands? Furthermore, should you buy your brand from the veterinarian, or is it okay to pick up at the supermarket? First and foremost, in choosing flea and tick products we want a product that works but is also safe for our pets. Products that are purchased from a veterinarian are backed and guaranteed by the manufacturer of the product. Online sources of the medication are not always backed by the manufacturer and could possibly be a counterfeit product, that at best doesn’t work, or at worst, could harm your pet. Finally, we should talk about what else is exposed to the product. Is it also safe for cats? This is an important point for homes that have both dogs and cats, as cats are very sensitive to some of the treatments commonly used for dogs. In addition are these safe if there are small children in the home that could come into contact with the product. You should have a discussion with your Vet. Before you even think about which type of flea and tick preventative to use, it’s very important to also talk with your veterinarian, because you need to make sure you’re giving your pet something that will take care of all types of fleas and ticks in your area. Some of the medicines on the market do not cover all of the ticks or other parasites that your pet may encounter. There’s no point in applying the medicine if it’s not going to be 100 percent effective, or not work against a particular parasite that is of concern. Your veterinarian can help you to decide on which of the three available forms you want to use — even if you don’t end up buying a product from the vet’s office. Flea and Tick preventative can be put into three big classes based on the application of the product. The three major forms of preventatives are: Collar, Topical (Spot-on), or Oral. Each one of these forms has their own advantages and disadvantages. There is no one best option you have to weigh your pets individual circumstances. Advantages. Collars are an easy choice for people who don’t want to be applying medicine between the shoulder blades every month or giving tablets for the dog to take orally. The collar can protect a dog or cat from fleas and ticks for up to eight months. Collars also usually have a repellant feature that is lacking in the oral products. Disadvantages. Such collars are expensive, relatively speaking, so you have to lay out more money at a time. In addition, if you lose the collar, you’re back to square one. In addition, bathing can reduce the duration of the collar’s effectiveness. In order to maintain an eight-month duration, for example, dogs must not be bathed more than once per month. For dogs that swim more than once a month, the duration of control against the parasites is reduced. Advantages. Once the medicine has been applied between the shoulder blades with a little pipette that accompanies the package, you don’t have to worry, as you do with a collar, that it will come off and get lost. These products also tend to be less expensive than a collar. Most spot-on products have a repellant feature that is lacking in the oral products. Disadvantages. Spot-ons usually need to be applied monthly, which is not a disadvantage if you stay on top of things and mark on the calendar when you last applied the medicine. But spot-ons, recommended once a month, start to undergo a decline in protection after four weeks. Spot-ons are also a problem for people who bathe their dogs very often or whose dogs are out swimming all the time, for example, in a lake. First of all, your dog can’t be bathed two days before or after applying the drug. Most active ingredients remain attached to the skin lipids, and if you remove them by bathing, the medicine does not persist on the skin surface. After that, if you bathe the dog once during the month or let him go swimming once, that’s okay. But if your dog is often swimming or if you bathe him frequently you may want to choose a different type. Advantages. Providing protection against fleas and ticks in pill form is probably the best way to go if you have a water-loving dog who’s often out in the water or a dog who, for whatever reason, needs frequent bathing. Water can never make the pills lose their potency. Also, the tablets are good for owners concerned about having an insecticide on the skin surface of the dog (for instance, because of close contact with children). Also depending on the product, it can be given either once a month or every three months. Disadvantages. One of the major disadvantages of oral products is the lack of a repellant feature. Also, some dogs will refuse to swallow a pill that you try to give them. You can wrap it in cheese or salami, yet the dog will spit out the pill or just let it drop out of his mouth. If that’s your dog, pills are not the way to go, even if your pal is often in the water. It should be noted, too, that a very small minority of dogs react to the pills with vomiting or diarrhea. Reactions tend to be mild — and they are rare — but it’s something to keep in mind. What’s best for my Pet? For the most part, the medicines recommended here do the trick, but given each pets individual needs or circumstances, there may be one product that is better for you than the others. That is why a discussion with your vet is important. We at Helping Paws believe that what’s best starts and ends with a discussion with you, the pet parent. We strongly believe, at the end of the day you know your pet best and what’s going to work for you.